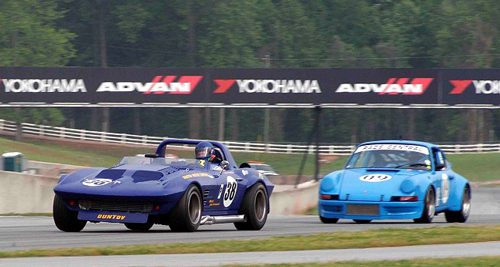 The Walter Mitty at Road Atlanta is one of our favorite events and it is surly one of the best and most competitive vintage races in the country. 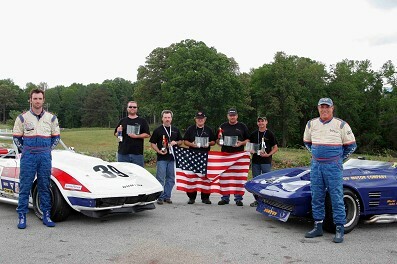 This year we only brought two cars to Atlanta, Edward’s #39 68 Corvette, fresh from his race wins and lap record performance at Sebring, and the Grand Sport roadster which was making the trip in spite of zero testing time. 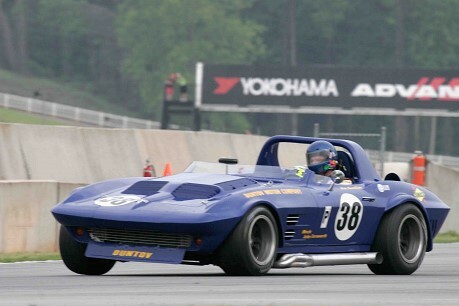 The Grand Sport was literally finished at Road Atlanta. Other than when it was driven into the trailer, the Grand Sport’s first actual drive was on the track during Thursday test day prior to the Walter Mitty weekend. We had brought three front spoilers, and expected we would need to swap them during testing to tune the lift on the car. As you probably know, the front end of the mid-year Corvette body has a tendency to generate lift at high speeds. Through a combination of spring rates, ride height adjustments and front spoilers, we were able to negate the front end lift on the Grand Sport to the point where the car could take Road Atlanta’s turn nine without lifting. Turn nine is a gentle right hand bend, but at 165 MPH it can be a bit scary if the front end is floating and the steering input is ineffective. The turn is situated on the brow of a hill, with the road heading sharply downhill from just about the middle of the turn. If you are not able to keep the car at the inside right edge at the exit of the turn (without lifting off the throttle), you will end up in the marbles to the left and onto some uneven pavement that makes braking difficult for turn 10a. It turned out that we had gotten all the aero adjustments correct back at the shop – the car was stuck to the track the first time through there, and we never had to make any adjustments at Road Atlanta! At the end of the Thursday test day, the Grand Sport was already quicker than the fastest lap ever run by the company’s previous racecar, LightWeight 001. Edward was a tick faster in his 68, but there wasn’t anyone else close among big bore cars. Out of the trailer the Grand Sport was fast, but next time it will be way faster! Friday had two practice sessions for the entire Group 5 field. The usual suspects were at the top of the time charts, Klaus Graf in a wicked fast 1974 3.0 RSR Porsche was at the top, then Edward, Alan, Larry Ligas in his XKE 4th with Eric Bretzel’s Porsche 5th. It rained all night Friday night, so the 8:00 AM qualifying Saturday morning was on a very wet track. The times were really slow, and the session was black flagged for a major wreck after about 5 laps with Edward second and Alan 5th. We waited in the hot pits for about 20 minutes and a friend of ours came by and said the session was over and that we might as well head back to the trailer. We did, but it wasn’t! After a few more minutes the session was restarted and continued for 20 minutes of green flag qualifying on a drying track. Edward’s time fell to 7th, and Alan’s to 17th! You will notice Edward acknowledging the full course black flag in the middle of the esses – signaling that the race was being called. The results were set at the completion of the last green flag lap. Obviously Edward won, while Alan only managed to go from 17th to 10th. The next event was the one-hour enduro on Sunday morning. The plan was for Alan to start in the Grand Sport and for Edward to take over at the mandatory pit stop. It was a beautiful and thankfully dry morning, and Alan started 10th, but was third by turn two and second by the end of the first lap. There was a brief skirmish with Eric Bretzel, but that settled, Alan began trying to close the gap on Klaus Graf in the Porsche RSR. After 20 laps it was still Graf first, Alan second and Bretzel third. Alan had turned the fastest lap so far, a 133.3, compared to Graf’s 133.5 and Bretzel’s 134.1. Edward took over the Grand Sport at the half way point, but retired the car after only a few laps with a handling problem. It turned out the rear camber rod mounting bracket had not been safety wired, and the rule is ‘that which is not safety wired will fall off’. It just about did. After Edward called it quits, Graf abruptly pulled off, his weekend over with engine problems; leaving the win to Eric Bretzel – again! The next race was the ‘Feature Race’, run at noon Sunday. 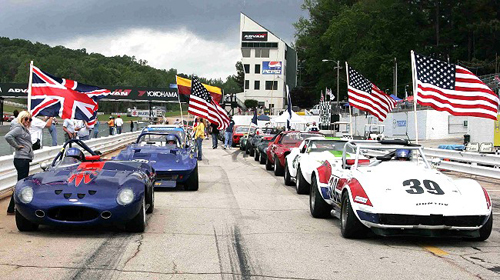 The race was billed as the ‘American Challenge’, with all the GT cars competing as if it was The USA verses the rest of the world. Kind of like real life! This shot was taken during the singing of the National Anthem. Larry Ligas started on the pole, with Edward second and Alan third. Edward led flag to flag, with Alan second. Third went to last year’s winner, a fuel injected Camaro driven by Sam LeComte. Ligas finished fourth, after he spun on the first lap in turn 7. The final race of the day inexplicably again saw Larry Ligas start from the pole, Edward second and Alan third. Alan passed Ligas at the start, but Larry got back around and the final results were Edward 1st, Ligas 2nd, and Alan 3rd. 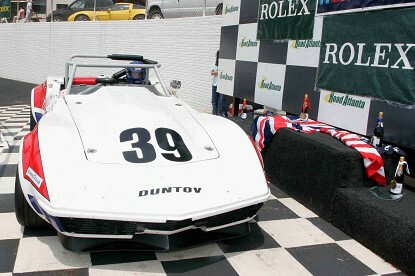 Overall it was a great weekend for the father and son team from Duntov Motor Company, and a great result for the Grand Sport. Now, with a little time, we can fine tune the Grand Sport and get to Road America with two cars capable of winning the race! I don’t know how it could get much better than this! 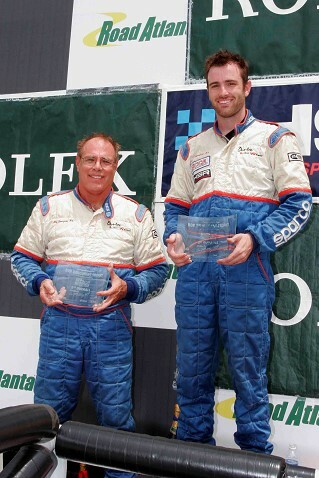 If only every race weekend could turn out for us just like the 09 Mitty!